"I just feel lucky. I don't feel like I own [a poem]. I made it, but that's different. It's more about the pleasure that's just there when it's done, whether anyone sees it or not. I see it myself, quietly. I'm not showing anyone. "—Jack Gilbert, An Interview with Jack Gilbert by Chard deNiord. 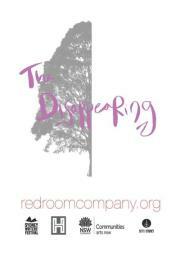 Please join The Red Room Company for The Disappearing Walking Tour. 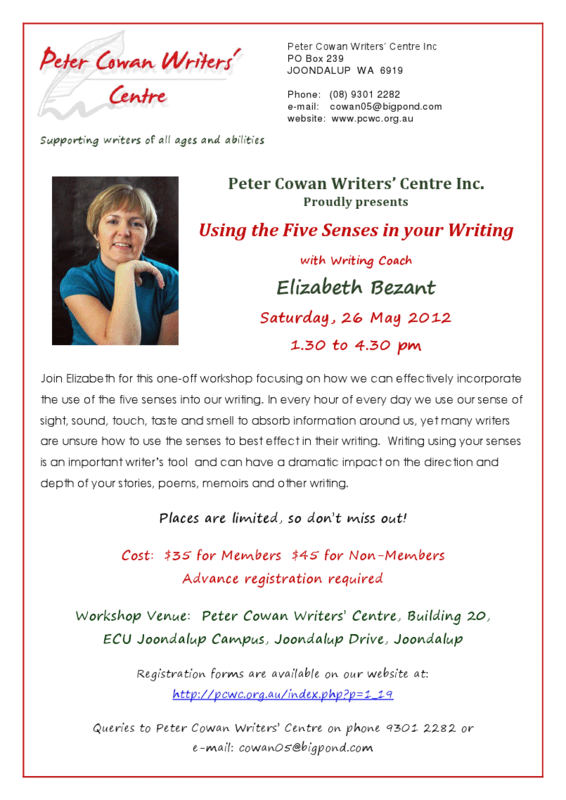 Uncover sydney’s hidden poetic currents with your guide Johanna Featherstone during Sydney Writers' Festival. Celebrated poets Martin Harrison, Astrid Lorange, Nick Bryant-Smith and Lorna Munro, as well as experts from The Historic Houses Trust will meet you along the way to explore poetry and place. 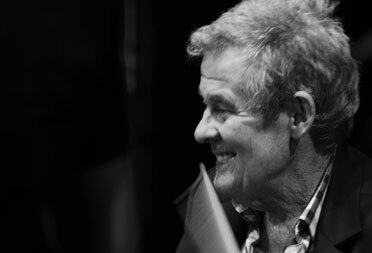 You may know him as a jazz drummer, patron of Stonnington Jazz, mentor of young musicians, recipient of a lung transplant. You may have heard him waxing lyrical at a gig at Bennetts Lane in Melbourne during his 18 year residency there. And you may have read his poems on some of the 110 CDs released with his name on them. 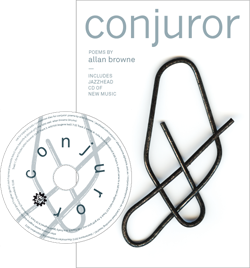 Conjuror collects 70 pieces by poetic auto-didact Browne into one volume. The poetry was written over 40 years. 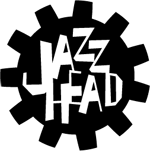 The verses speak of jazz and its doctors, home and hearth, love and life, music and this mad, mad world. Seven poems from the collection frame the music on On it, Browne’s long standing sextet (see personnel below) swing in 7 tunes that mix contemporary and classic jazz with poetry. You may know many things about Allan Browne, but Conjuror holds some wonderful surprises. Conjuror is to be launched on Monday 4 June 2012 at Melbourne International Jazz Festival with the Allan Browne Sextet. Or join in on Wednesday 6 June at Uptown Jazz Cafe, with the Allan Browne trio. 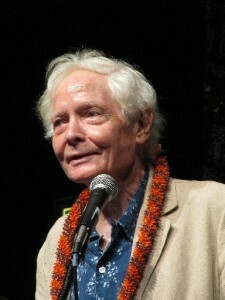 “Those were great gifts she told me from the beginning — the things I wasn’t afraid of,” Merwin says, when I mention the poem. That leads him to another childhood memory, spooning dried peas into a brass bowl over and over again, mesmerized by the sound. of the above will be displayed. noun 1. an imaginary creature of Aboriginal legend, said to haunt rushy swamps and billabongs. 2. Obsolete a full-grown beast (def. 2) which has remain unbranded. Bunyips, apparently, are nocturnal creatures known to haunt waterholes. It’s been suggested that there are more than a couple of Australian poets to whom this description might apply. This, certainly, is a rich poetry issue, a nest-full of the finest new writing, from Jennifer Maiden, John Kinsella, Maria Takolander, Michael Farrell, Craig Powell, Michael Sharkey, Kate Middleton and many others (several of them quite tea-totalling), plus essays by Kevin Hart on A.D. Hope, Lachlan Brown on Kevin Hart, Michael Buhagiar on Christopher Brennan, Suzie Cardwell on John Scott, Mike Ladd on poetry and radio, John Jenkins on poetry and film, Michael Ackland on Murray Bail, and, here and in The Long Paddock, further bunyipery of the highest order: reviews of many new poetry collections, an interview with Laurie Duggan, and a striking selection of new short fiction. Please come to the launch of the latest issue of Southerly, A Nest of Bunyips. The launch will have food and wine, and of course, lots of readings from our fabulous contributors. On Saturday 28 April at Perth Poetry Club we are thrilled to present BRON BATEMAN and GLEN PHILLIPS. 2-4pm at The Moon, 323 William St, Northbridge, WA. Plus open mike. 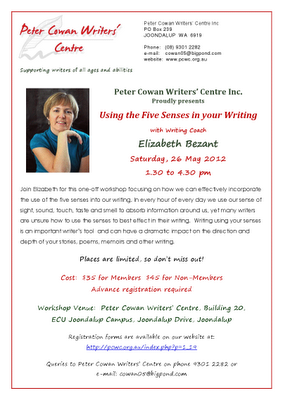 Bron Bateman has a Doctorate in Creative Writing and a collection published, people from bones. She has work published in the US, Britain and Australia. Her poetry deals with the body, sexuality and issues that are hard to deal with. If you've experienced the rare treat of hearing Bron read her poetry, you'll know why we are excited to have her. Otherwise come along and find out. When I arrived at the London Book Fair on Monday, I saw a huge sign outside showing a cute Chinese boy holding an open book with the words underneath him: “China: Market Focus.” The special guest of this year’s fair was the Chinese Communist Party’s censorship bureau. Assisted by the government-funded, but independent, British Council, the fair’s organizers invited the General Administration of Press and Publication (GAPP)—the Communist Party’s designated body for ensuring that all publications, from poems to textbooks, are certified fit for the public at home and abroad to read. What has caused a bitter public wrangle in London is that Beijing not only chose—with the full approval of the fair itself and of the British Council—which writers to bring to the fair. In a disturbing repeat of what happened at the Frankfurt Book Fair in 2009, it also excluded some of China’s best-known writers. Among these are two Nobel Prize winners: Gao Xingjian, China’s only Literature Prize laureate, who lives in nearby Paris, and Liu Xiaobo, the Peace Prize winner who is now serving out an eleven-year prison sentence. More scandalous still, not one of China’s diaspora poets and novelists was invited, even though most of the country’s most distinguished writers live abroad. Click above on New York Review BLOG for more. 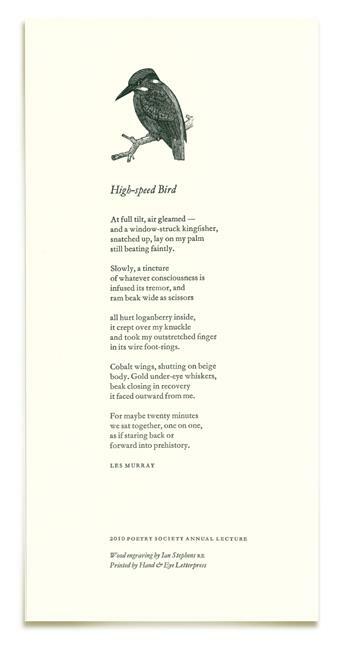 We're giving away limited # of Les Murray prints of poem 'High-speed Bird' Teeny-weeny damage. in the recording, get up and reduce the treble. When you've finished your first paragraph, sit back for a bit. casting its zebra pattern on the wall to your left. 18 Monday Martin Luther King's Birthday (Observed). You well might wonder where both of them are now. unpaid bills, the letters you forgot to open. No joke, now. writing. This is your life we're dealing with here. This is your last chance to get it down right. one last stab at something beautiful before the end. at the cat. All that it wants is your hands on it. -- Born in Newburgh, New York, Halvard Johnson grew up in New York City and the Hudson Valley. He has received grants from the National Endowment for the Arts, the Maryland State Arts Council, and Baltimore City Arts. Among his collections of poetry are Transparencies and Projections, The Dance of the Red Swan, Eclipse, and Winter Journey—all from New Rivers Press and, now out of print, archived at the Contemporary American Poetry Archives. Recent collections include Rapsodie espagnole,G(e)nome, The Sonnet Project, Theory of Harmony—all from www.xpressed.org—and The English Lesson, from Unicorn Press. Hamilton Stone Editions has published two collections: Guide to the Tokyo Subway and Organ Harvest with Entrance of Clones. He has lived and worked in Chicago, Illinois; El Paso, Texas; Cayey, Puerto Rico; Washington, D.C.; Baltimore, Maryland; and New York City. For many years he taught overseas in the European and Far East divisions of the University of Maryland, mostly in Germany and Japan. He currently resides in San Miguel de Allende, Mexico. ABR Elizabeth Jolley Short Story Prize - Enter Now! 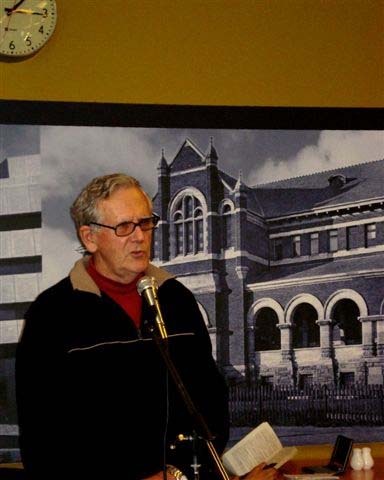 Authors must be Australian citizens or have permanent resident status in Australia. Each entry must be a single authored short story in English of between 2000 and 5000 words. The results will be announced in September and the winning story will be published in the September 2011 (Fiction) issue. In particular, he has studied the "dragline" silk that spiders dangle from, quantifying its strength in a 2007 paper in Polymer Journal. 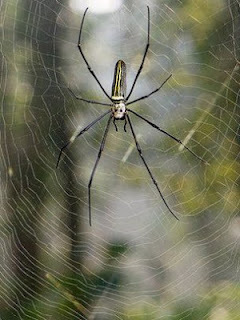 Dr Osaki used 300 female Nephila maculata spiders - one of the species of "golden orb-weavers" renowned for their complex webs - to provide the dragline silk. He then set about measuring their tensile strength - a critical factor for violinists wishing to avoid breaking a string in the midst of a concerto.For each string, Dr Osaki twisted between 3,000 and 5,000 individual strands of silk in one direction to form a bundle. The strings were then prepared from three of these bundles twisted together in the opposite direction. Dr Osaki suggests that it is this feature of the strings that lends them their strength and, crucially, their unique tone.A closer study using an electron microscope showed that, while the strings themselves were perfectly round, in cross-section the strands had been compressed into a range of different shapes that all fit snugly together, leaving no space between them. The US Postal Service has announced publication of 10 Forever stamps honouring 20th Century US Poets. Forever stamps are stamps which keep their current market value for posting as long as you need them. (But, as the old saying puts it, Nothing lasts forever.) Postage stamp collectors have twenty days to buy these new artworks - and a lifetime to relish the works and writings by and about their favourite poets. There's even a quote from the poet on the back of the stamp! 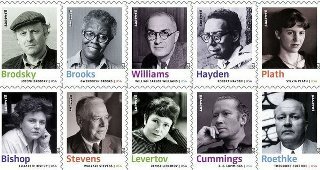 The Twentieth-Century Poets honored by the Postal Service include Elizabeth Bishop, Joseph Brodsky, Gwendolyn Brooks, E.E. Cummings, Robert Hayden, Denise Levertov, Sylvia Plath, Theodore Roethke, Wallace Stevens and William Carlos Williams. Each stamp features a photograph of one of the 10 poets. Text on the back of the stamp sheet includes an excerpt from one poem by each poet. The art director was Derry Noyes. Elizabeth Bishop was known as a "writer's writer," suggesting the admiration other poets feel for her work. The photograph of Elizabeth Bishop was taken in her home in Key West, FL, by Josef Breitenbach. E.E. Cummings expertly manipulated the rules of grammar, punctuation, rhyme and meter to create poems that resembled modernist paintings more than traditional verse. The E.E. Cummings stamp features a photograph of Cummings taken in 1935 by Edward Weston. 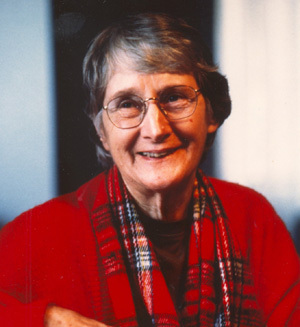 An award-winning author of more than 20 collections of poetry, Denise Levertov wrote mystical, meditative poems about nature, spirituality, love, and loss as well as antiwar poems. The Denise Levertov stamp features a photograph of Levertov taken by Rollie McKenna. Sylvia Plath probed the conflict between inner self and outward appearance. Her complex body of work includes deftly imagined poems about marriage and motherhood, gender and power, death and resurrection, and the search for self. The Sylvia Plath stamp features a photograph of Plath taken by Rollie McKenna. The Elizabeth Bishop, E.E. Cummings, Denise Levertov and Sylvia Plath photographs are part of the collection at the Center for Creative Photography at the University of Arizona, Tucson. Joseph Brodsky, an exile from the Soviet Union, was the first foreign-born poet to be appointed Poet Laureate of the United States. The Joseph Brodsky stamp features a photograph of Brodsky standing on a pier on the Hudson River in New York City. The photograph was taken by Nancy Crampton. Gwendolyn Brooks is best remembered for distinctive, lyrical portraits of everyday urban life. The Gwendolyn Brooks stamp features a photograph of Brooks in her Chicago home. The photograph was taken in 1987 by Jon Randolph. The poems of Robert Hayden reflect his brilliant craftsmanship, his historical conscience and his gift for storytelling. The Robert Hayden stamp features a photograph of Robert Hayden taken around 1975 by Timothy Franklin. The photograph is part of the Prints and Photographs Division at the Library of Congress. Theodore Roethke created intimate, introspective poems distinguished by lyricism and a sensual use of imagery. The Theodore Roethke stamp features a photograph of Roethke taken in London, England. The poems of Wallace Stevens explore language and meaning that make reading a distinctive experience. The Wallace Stevens stamp features a photograph of Stevens taken by Sylvia Salmi. The image is from Bettmann/CORBIS. William Carlos Williams was a doctor who typed out his poems between seeing patients. His work showed readers the extraordinary in the commonplace. The Williams stamp features a photograph taken in the 1940s. The photograph is from the Beinecke Rare Book and Manuscript Library at Yale University. The stamps on the Twentieth-Century Poets pane are being issued as Forever stamps. Forever stamps are always equal in value to the current First-Class Mail 1-ounce price. More to be read HERE. things in this universe. Parentage becomes obscure. What is eaten changes places with that which eats. depends on where you stand. Stand somewhere. Don Marquis and Archy's "a spider and a fly"
ABC Jazz: "Happy Birthday, Billie Holiday"
MILES DAVIS was picking up eggs!